and when I need them. I like to freeze several breasts together in a Ziploc bag filled with water. I think they stay fresh like that. My all time favorite way to grill dove is to wrap them up in bacon before I put them on the pit. I also add one or two slices of jalapeño, and maybe even a little cream cheese. 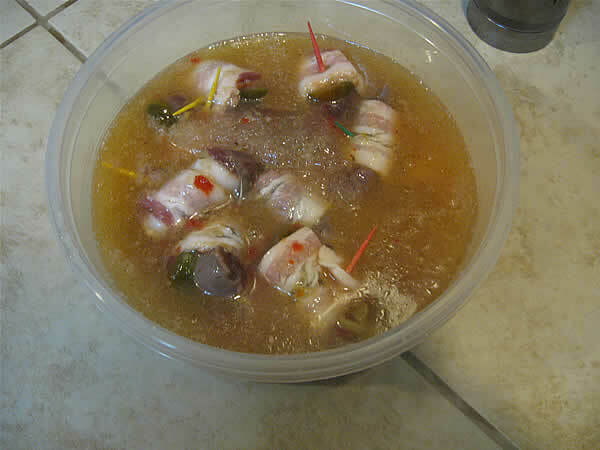 I have provided my great recipe for grilling bacon wrapped dove, which makes a great appetizer before the big game, or a delicious meal that can be accompanied by black eyed peas soaked in Brer Rabbit Syrup (thanks Grandpa!!) and wild rice. 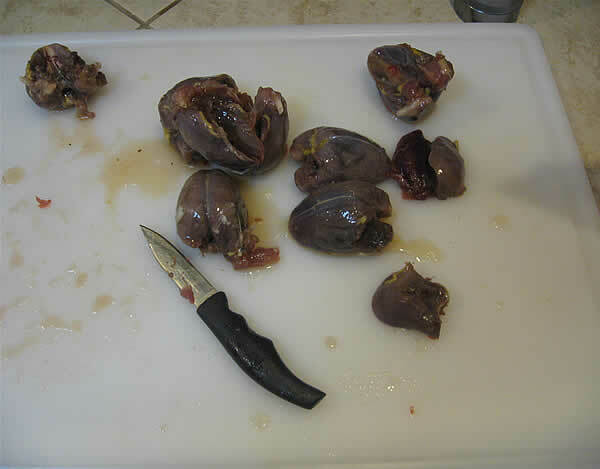 Trim all fat and bullet trauma off of the dove breasts. Trim the meat from the dove breastbone. Use 1/2 slice of bacon to wrap dove and a jalapeño. Secure with a toothpick. Soak the Dove in Italian Dressing for 4 hours. 2. 1 Bottle of Italian Salad dressing. 1. Soak the toothpicks in water for at least 30 minutes. 2. Trim all fat and bullet trauma off of the dove breasts. 3. 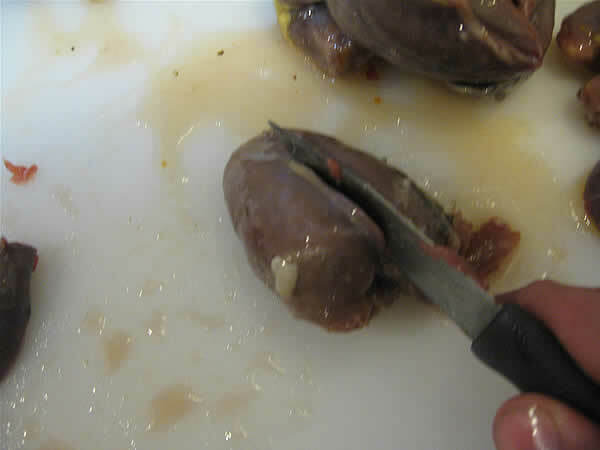 Trim each dove breast off of the breast bone. 5. 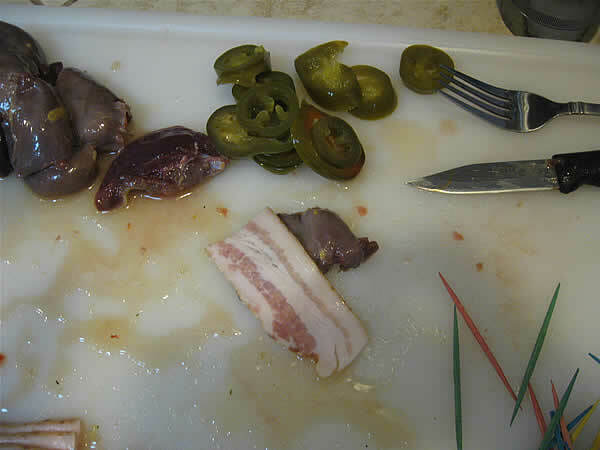 Place a jalapeño slice next to each breast, wrap with bacon, and push a toothpick through to lock in place. 6. Place each wrapped dove breast in the marinade. 7. Marinade for about 4 hours. 8. Build a medium fire in your pit and let the coals burn down. (About 20-30 minutes) I also add a piece of pecan wood for great flavor. 9. I use a fish grilling basket to grill all of the dove at one time. This is much easier than having to flip each dove breast. Make sure you space the m out if you use one. 10. If you don't have a basket, cook the dove breast indirectly; around the fire not over the fire. 11. The are done when the bacon is done. Don't overcook the bacon.